I picked up Detroit Dark Red and Avalanche beet seeds at Agway. Soaked overnight and sowed some in a mounded row with extra fertilizer added. Earliest of the radishes are starting to come in, but some of them are starting to bolt also (and then there seems to be some very late ones that haven't shown any sign of bulging.... I wonder if I should fertilize some more). I think there was a day or two when I should have watered instead of hoping for rain. Now that we did have rain, baby slugs are all over them. 5/23 ETA -- loose leaf Chinese cabbage Osaka Shirona in the middle right and heading type Kyoto No.3 in the front, with Tatsoi in between and Komatsuna (another loose leaf) in the front to the left with left-behind volunteer garlic and 2nd yr Lunar carrots and parsley that I'm hoping to get seeds from. Broccoli in the back. IcebergA lettuce along the right ... Etc. etc. 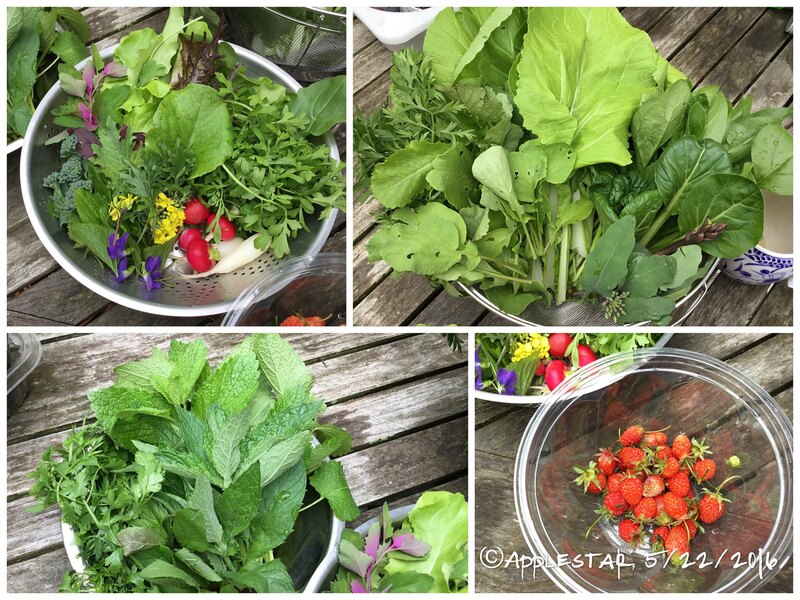 TOP LEFT salad fixin's -- lettuce (thinned and cut-and-come IcebergA, Bibb, volunteer red, Mascara), Garden Cress, arugula, earliest radishes (bunny tail, Swiss melange), baby red Russian kale. 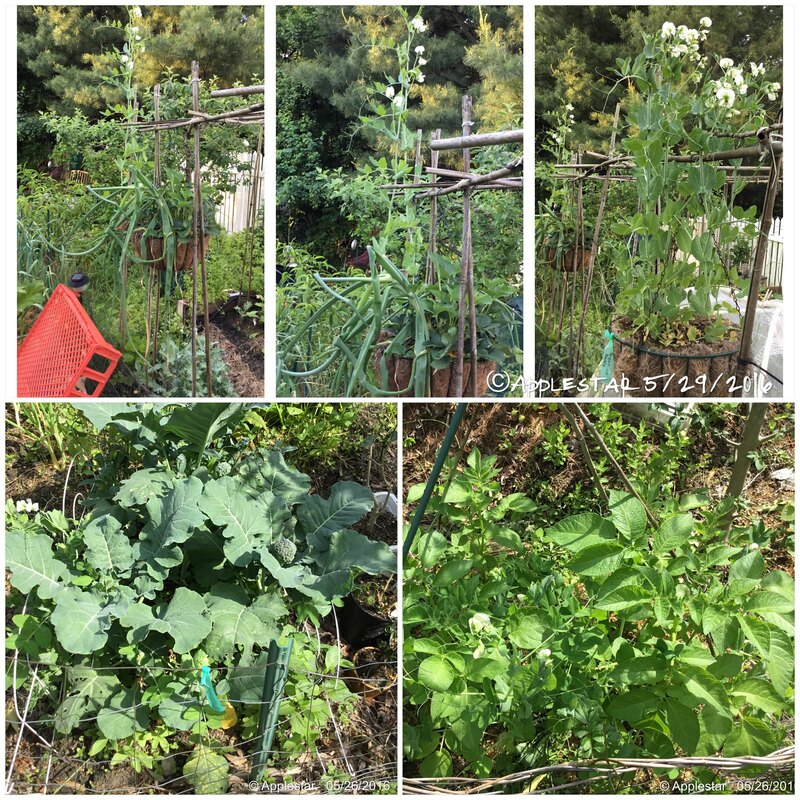 yellow kale flowers and buds, violet flowers and baby leaves, plantain baby leaves, broccoli side shoots, magenta spreen/Spinach Tree (basically lambs quarters with magenta colored new leaves), red orach. TOP RIGHT: stir fry greens -- loose leaf Chinese cabbage Osaka Shirona, Tatsoi, kale flower shoots, purple passion asparagus, radish tops, bolting celery and carrot tops. Last edited by applestar on Mon May 23, 2016 7:52 pm, edited 1 time in total. Reason: Added description of VGA vegs. I like all the color in the top left bowl applestar, what all do you have in there? Edited the above post with caption for the harvest collage. Beautiful GGS (good green stuff) Applestar! I have great luck capturing slugs using little yogurt cups (the wide-mouth kind) with beer-bait. They slide in and drown. I scoop out a little hole, so the rim is at soil level, empty and replenish every day or so. Thanks! I found a few more big' uns between garlic stems and leaves yesterday, and two of the runner beans have lacework leaves. I did put down some DE but am planning to go at them using several different methods. 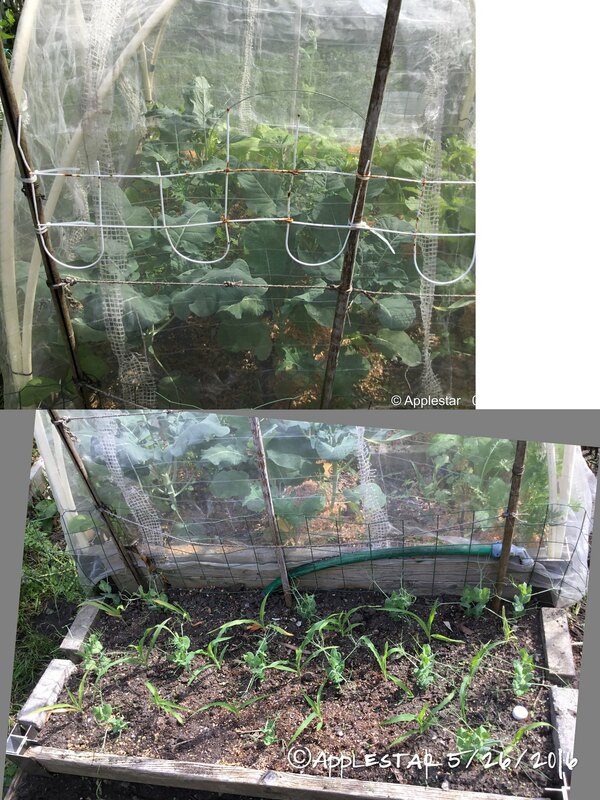 I've had my share of frustration to the point of nearly bursting into tears over the typical black plastic bird netting that tangle up easily in larger sizes. So this year, I opted for nylon woven fishnet type. 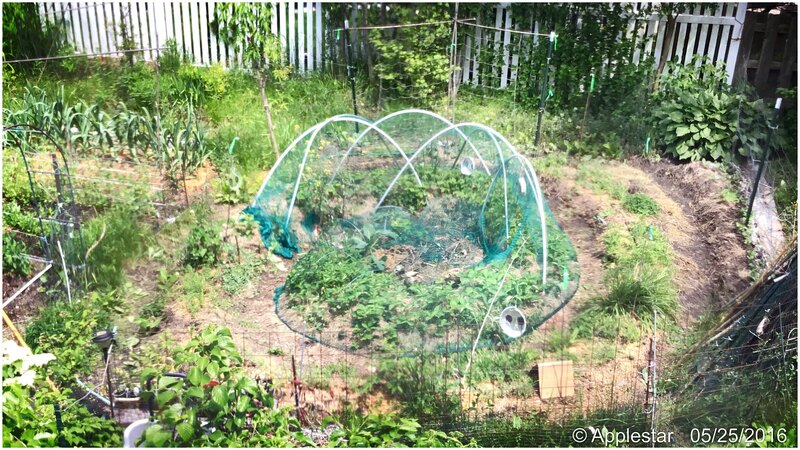 I'm not one to measure, but I lucked out and this one turned out pretty much perfect for the Inner Spiral, and my makeshift hoops seem to be adequate for the job with the wire compost bin holding up the middle. So, yesterday, what I did was take those seedzipped sprouted cucurbits, and instead of planting them in little cups safely in the house, planted them directly in the garden. Of course it was a blazing hot, sunny day -- and these delicate seedlings were so tender that cotyledons of a squash in one zeedzip that I'd accidentally left where the sun moved around to shine on it lost the tips of its seedleaves from being burned in a matter of minutes. I knew though, that I was taking a chance, and I watered them in as I planted so that the soil and the 1/2-1 cup of potting mix I put in each hole swirled around and covered the seedlings with fine particles (a little sunblock), and then I put a clump of the raked dry grass thatch I had used for mulching the strawberries over the seedlings so they would have a little shade and humidity. Even so, I wasn't positive they would make it. But today, it looks like they have raised themselves up from being plastered onto the soil, and some of the more vigorous squash had push the grass up and aside. 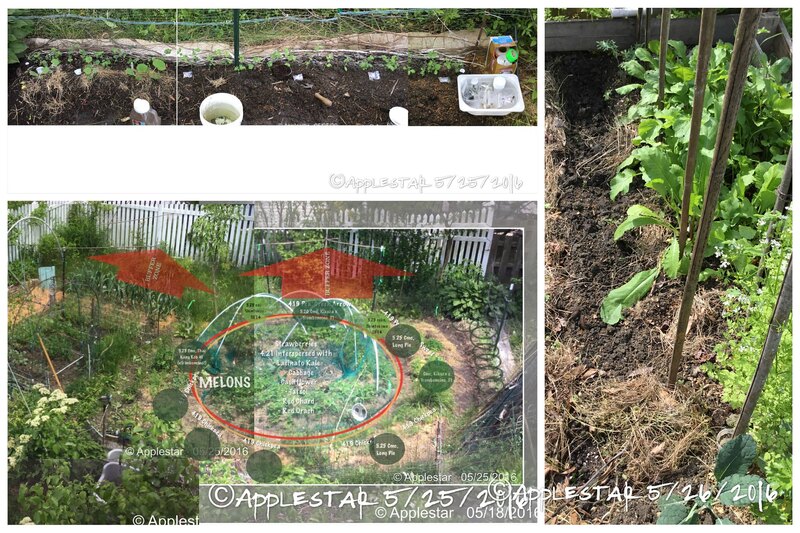 Here's a panoramic collage I made of the Spiral Garden Annex where I planted Kakai squash to occupy and hopefully, thoroughly shade out the weeds at the ground level, and H-19 Littleleaf cucumbers to climb the short fence with the Blawschokker Blue peas. You saw the map before, but I'll include for reference. 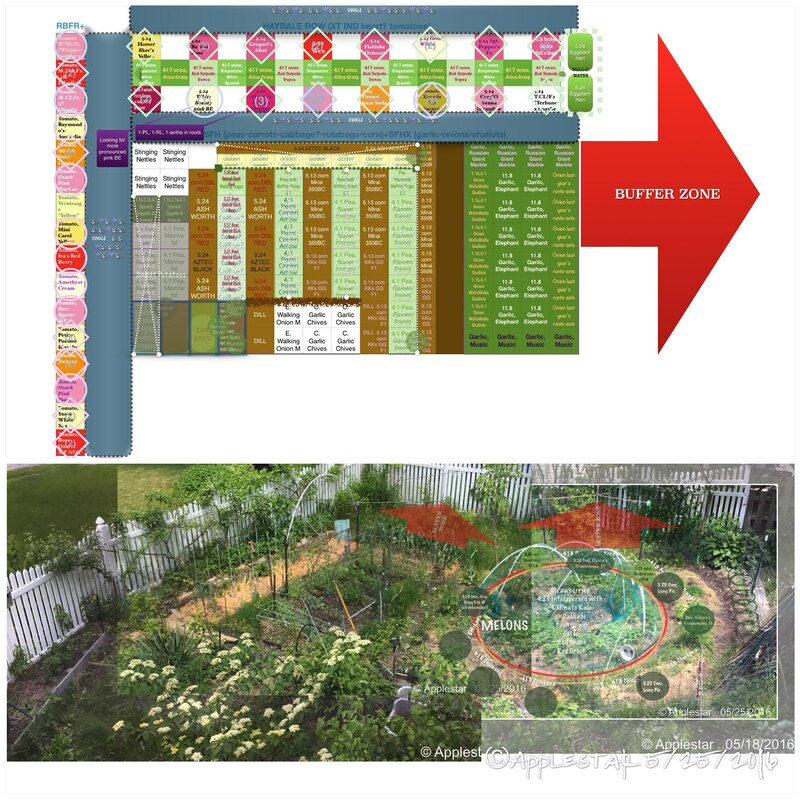 I intend to plant Shitokiwa cucumber along the outer Spiral in the back, along the path on the other side of the trellis netting where the peas will grow first. 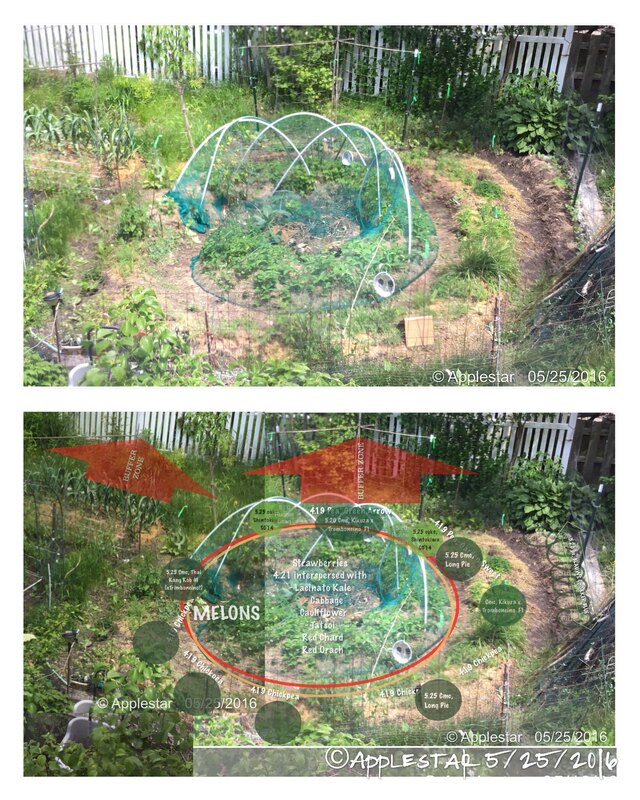 Even though that will skirt the "Buffer Zone", there are shrubbery planted on both our side and their side of the fence along that particular stretch, so it's not too likely that anything they spray on their side will reach the cucumbers, and in any case, the fruits are more likely to push past the trellis to the sunnier Inner Spiral side to grow, and worst case, the cucumber leaves will also provide another layer of barricade to protect the Inner Spiral. 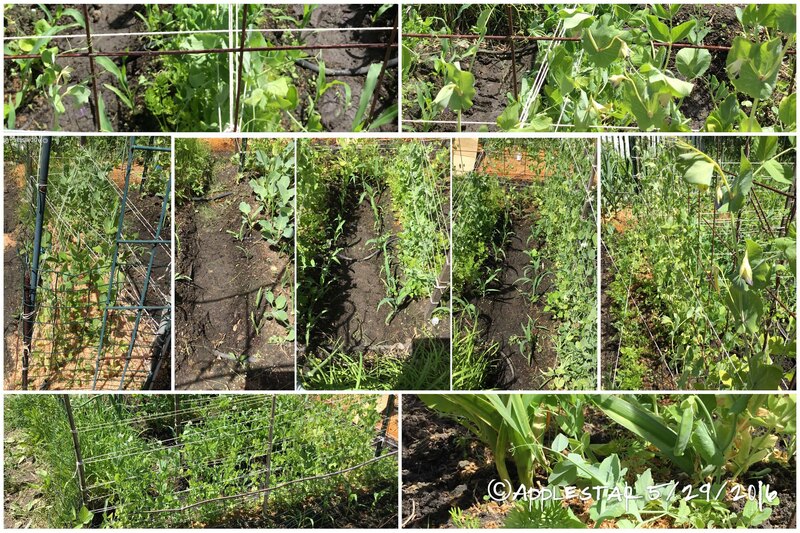 The photo on the right is the border bed between VCD raised bed of radishes and VGC. 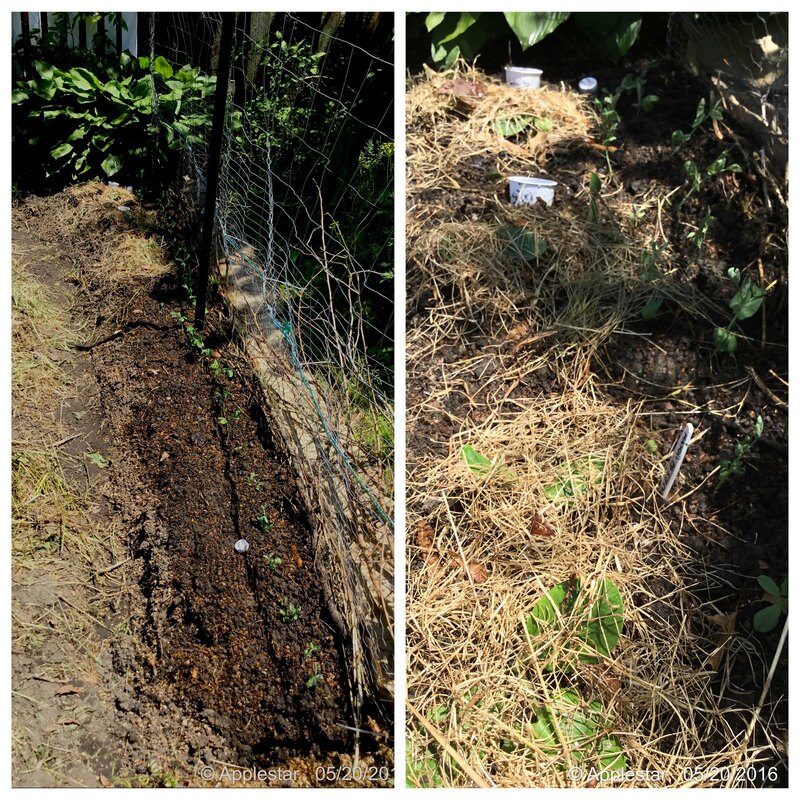 I planted pre-germinated Pickarow pickling cucumbers here and Luffa on the north (closest in the photo) end. I'm hoping to create a shaded bed here for heat sensitive plants and possibly get an early start for the fall harvesting crops. You might be able to count four small clumps of dry grass shading the sprouted cucumber seedlings, and the one large clump of dry grass shading the Luffa seedlings. VGB corn patch with Marrowfat peas and the insect mesh covered VGA. If the Mirai350BC corn seedlings don't hurry up and surge ahead, they are going to get overwhelmed by the aggressive double tendriled Marrowfat Peas. 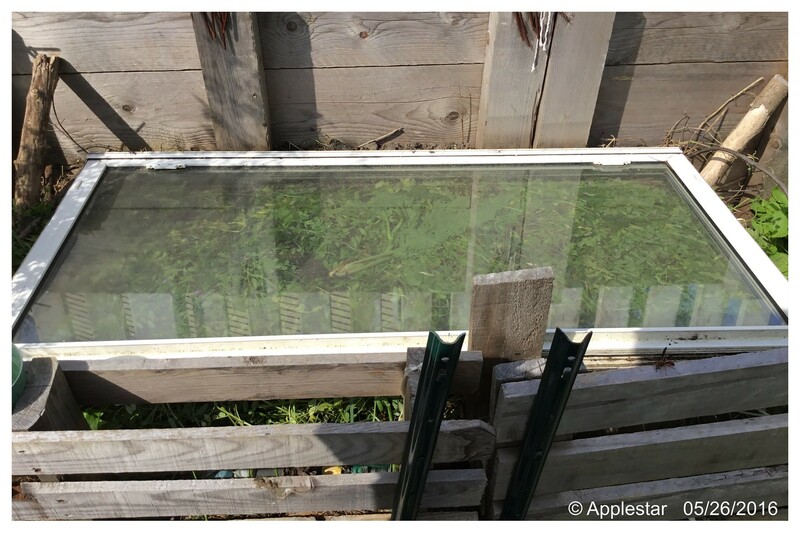 FWIW -- the pallet sided raised bed on the fence end of the VGB -- behind me as I'm standing on the walkwayâ€¢swale in between -- has been in use as yard waste compost pile, covered with a skylight window that I had picked up (it still has aeration from the open pallet slats on the sides). I watched the weeds, etc debris dry up and perhaps get solarlized, condensation on the double-glazed glass soaking back in, then wormsigns -- earthworm casting mounds -- at first dotting here and there, but by yesterday, the entire surface under the window consisted of solid castings... So I put down another layer -- mostly cover crop vetch pulled as they were starting to bloom, as well as some shrubby prunings. Covered with the window again. We will see. See that wasp on the bottom right edge of the window? Prolly looking for a nice fat cabbage worm! 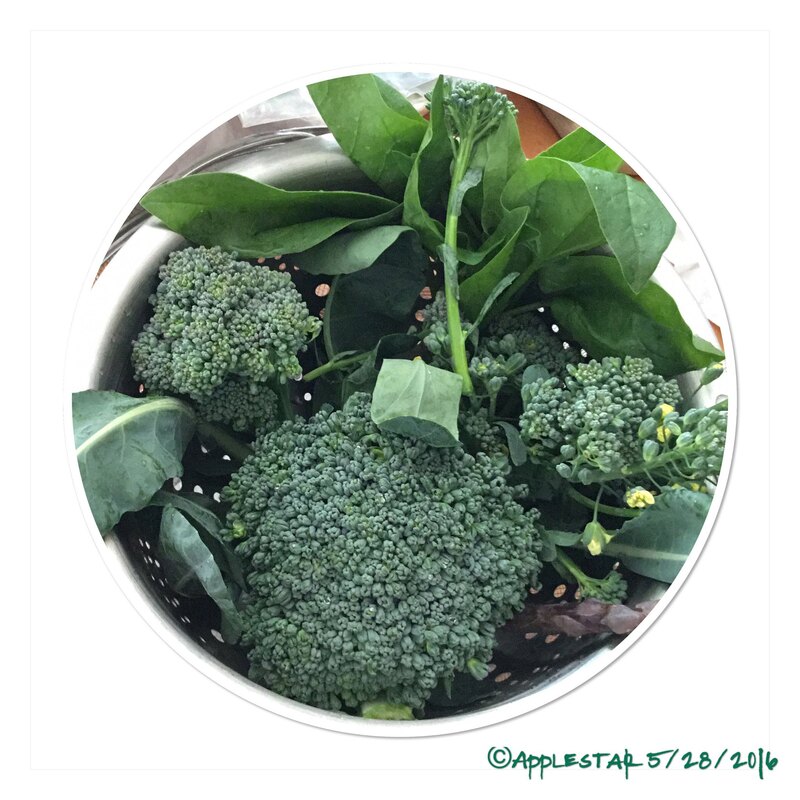 Yep, they are really great -- they get inside the broccoli heads and cabbage leaves, inside corn leaves -- all the places that are hard for me to poke around. We've been going through a summer-level heat wave. My Peas have only just started to bloom and just starting to set pods. It's going to be rainy/cloudy and in 70's, low 80's tomorrow, and then things are going to actually cool down with highs of 70's for a while. So hopefully they will hang in there and give us a full harvest. I saw you mentioned in another topic ( weeks ago???) that you make a banana peel tonic and do foliage sprays with that. Correct? If so, have you noticed a decrease in aphids? The reason I ask, is because I read SOMEWHERE, that leaving banana peels around the base of the plant helps to keep them away..... I don't think so.... But it did get me thinking about foliar banana tonic spray, and if it might have any uses for aphids. 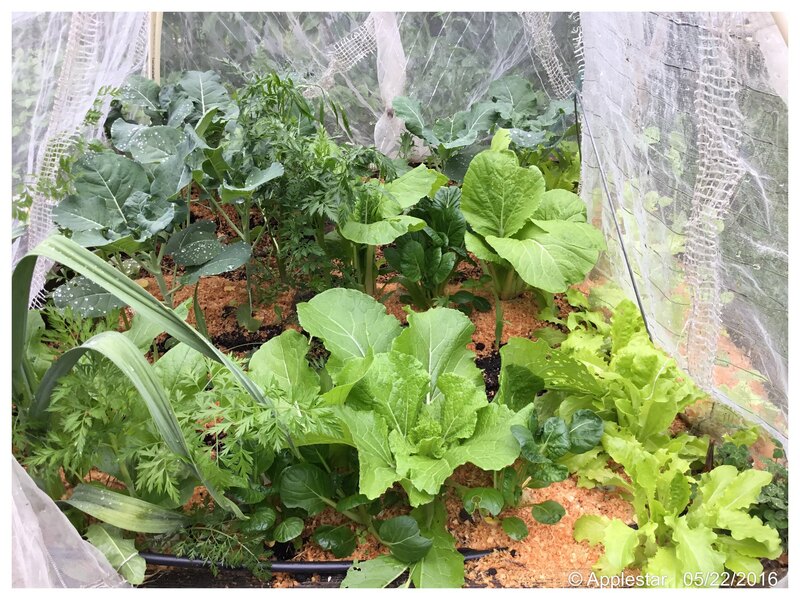 Nah, that was for the winter -- just for fun and variation in feeding the container plants in the Winter Indoor a Garden (and keeping the worms in the containers fed). It's easier to just toss the banana peel in the compost pile now.